Gene drives aim to deliberately spread bad genes when invasive species such as mice reproduce. Gene drives – a technique that involves deliberately spreading a faulty gene throughout a population – promises to do exactly that. Conservationists are understandably excited about the possibility of using gene drives to clear islands of invasive species and allow native species to flourish. Read more: Gene drives may cause a revolution, but safeguards and public engagement are needed. Hype surrounding the technique continues to build, despite serious biosecurity, regulatory and ethical questions surrounding this emerging technology. Our study, published today in the journal Proceedings of the Royal Society B, suggests that under certain circumstances, genome editing could work. The penguins on Antipodes Island currently live alongside a 200,000-strong invasive mouse population. The simplest way to construct a gene drive aimed at suppressing a pest population is to identify a gene that is essential for the pest species’ reproduction or embryonic development. A new DNA sequence – the gene-drive “cassette” – is then inserted into that gene to disrupt its function, creating a faulty version (or “allele”) of that gene. Typically, faulty alleles would not spread through populations, because the evolutionary fitness of individuals carrying them is reduced, meaning they will be less likely than non-faulty alleles to be passed on to the next generation. But the newly developed CRISPR gene-editing technology can cheat natural selection by creating gene-drive sequences that are much more likely to be passed on to the next generation. Read more: Now we can edit life itself, we need to ask how we should use such technology. Here’s how the trick works. The gene-drive cassette contains the genetic information to make two new products: an enzyme that cuts DNA, and a molecule called a guide RNA. These products act together as a tiny pair of molecular scissors that cuts the second (normal) copy of the target gene. To fix the cut, the cell uses the gene drive sequence as a repair template. This results in a copy of the gene drive (and therefore the faulty gene) on both chromosomes. This process is called “homing” and, when switched on in the egg- or sperm-producing cells of an animal, it should guarantee that almost all of their offspring inherit the gene-drive sequence. As the gene-drive sequence spreads, mating between carriers becomes more likely, producing offspring that possess two faulty alleles and are therefore sterile or fail to develop past the embryonic stage. Initial attempts to develop suppression drives will likely focus on invasive species with rapid life cycles that allow gene drives to spread rapidly. 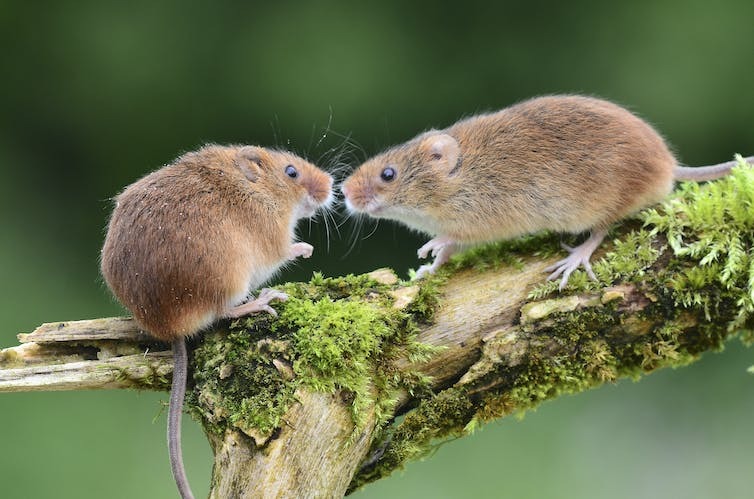 House mice are an obvious candidate because they have lots of offspring, they have been studied in great detail by biologists, and have colonised vast areas of the world, including islands. In our study we developed a mathematical model to predict whether gene drives can realistically be used to eradicate invasive mice from islands. Our results show that this strategy can work. We predict that a single introduction of just 100 mice carrying a gene drive could eradicate a population of 50,000 mice within four to five years. But it will only work if the process of genetic homing – which acts to overcome natural selection – functions as planned. Just as European rabbits in Australia have developed resistance to the viruses introduced to control them, evolution could thwart attempts to use gene drives for biocontrol. Experiments with non-vertebrate species show that homing can fail in some circumstances. For example, the DNA break can be repaired by an alternative mechanism that stitches the broken DNA sequence back together without copying the gene-drive template. This also destroys the DNA sequence targeted by the guide RNA, producing a “resistance allele” that can never receive the gene drive. A recent study in mosquitos estimated that resistance alleles were formed in at least 2% of homing attempts. Our simulation experiments for mice confirm this presents a serious problem. After accounting for low failure rates during homing, the creation and spread of resistance alleles allowed the modelled populations to rebound after an initial decline in abundance. Imperfect homing therefore threatens the ability of gene drives to eradicate or even suppress pest populations. One potential solution to this problem is to encode multiple guide RNAs within the gene-drive cassette, each targeting a different DNA sequence. This should reduce homing failure rates by allowing “multiple shots on goal”, and avoiding the creation of resistance alleles in more cases. To wipe out a population of 200,000 mice living on an island, we calculate that the gene-drive sequences would need to contain at least three different guide RNA sequences, to avoid the mice ultimately getting the better of our attempts to eradicate them. Are gene drives a hyperdrive to pest control, or just hype? Part of the answer will come from experiments with gene drives on laboratory mice (with appropriate containment). That will help to provide crucial data to inform the debate about their possible deployment. We also need more sophisticated computer modelling to predict the impacts on non-target populations if introduced gene drives were to spread beyond the populations targeted for management. Using simulation, it will be possible to test the performance and safety of different gene-drive strategies, including strategies that involve multiple drives operating on multiple genes. The link below is to an article reporting on the crisis for wildlife populations in the tropics where wildlife populations have crashed by 61% in the last 50 years. The article below reports on how genetically modified crops are killing off Monarch Butterfly populations. There is also a simple answer to the problem revealed in the article.